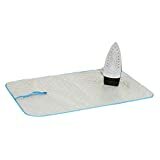 If you don't want to waste extra space storing a huge ironing board for the few times you need to iron clothes, then check out this cool new Ironing Blanket. 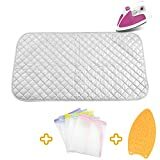 When it's time to dewrinkle some clothes, just lay this heat- and scorch-resistant silicone-coated cotton ironing blanket on a flat surface, iron away and then fold back up when finished. 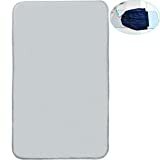 A great compact solution for college students, apartments, traveling and more.